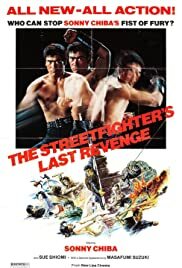 Takuma Tsurugi (Sonny Chiba) (AKA: The Street Fighter"), rather like James Bond, is an assassin for hire, a man who is a master of disguise and the martial arts but don't cross or betray him because if you do, you will pay and pay dearly. He, again rather like James Bond, has a weakness for playing with dangerous women, particularly the most ruthless and cutthroat. Here the villains, who have hired Tsurugi to get two tape cassette recordings that when played in unison provide a formula for creating synthetic heroin potentially worth a fortune in the wrong hands, make that most fatal mistake of crossing Tsurugi. And now they will pay! This moves at a brisk pace, is exciting and action-packed, and feels like a much darker take on a James Bond type of film. It's not really all that much like the previous "Street Fighter" fare at all but it is fun if you're willing to forgive that fact. The only problem I had with the film was all the betrayals and double-dealings became confusing after a time and I was surprised Tsurugi allowed himself to be put into a position where he could be betrayed by the lead villains on more than one occasion. Also Tsurugi is hardly an heroic male lead, in fact he's every bit as ruthless and unrelenting, if not even more so, that this story's villains. Still the good in terms of entertainment value here I feel far outweighs the bad.